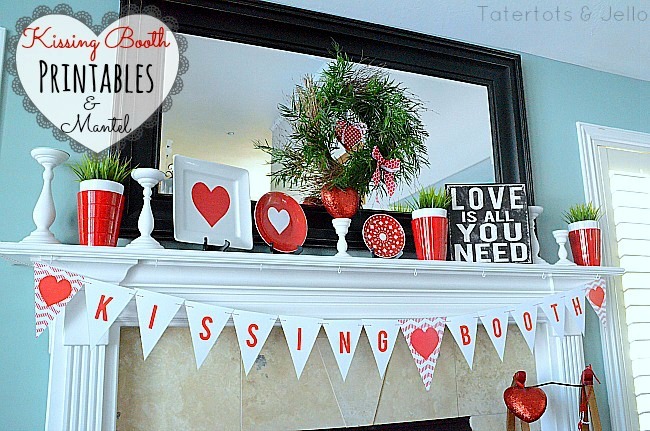 Free Kissing Booth Valentine Printable Bunting and Valentine’s Day Mantel! 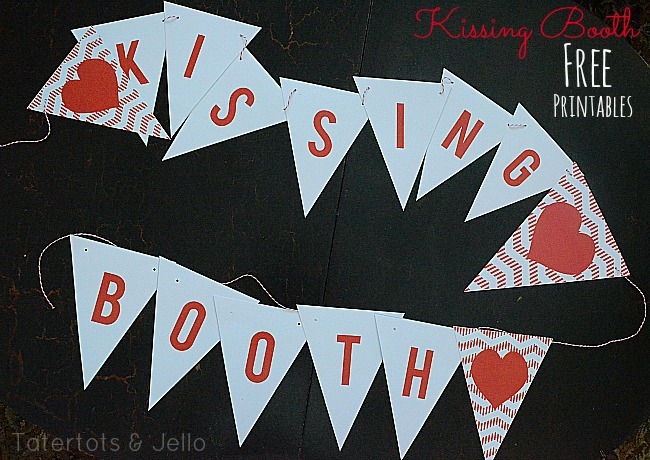 Enjoy this Valentine’s Day Printable and free kissing booth printable! I love decorating my mantel for the holidays. 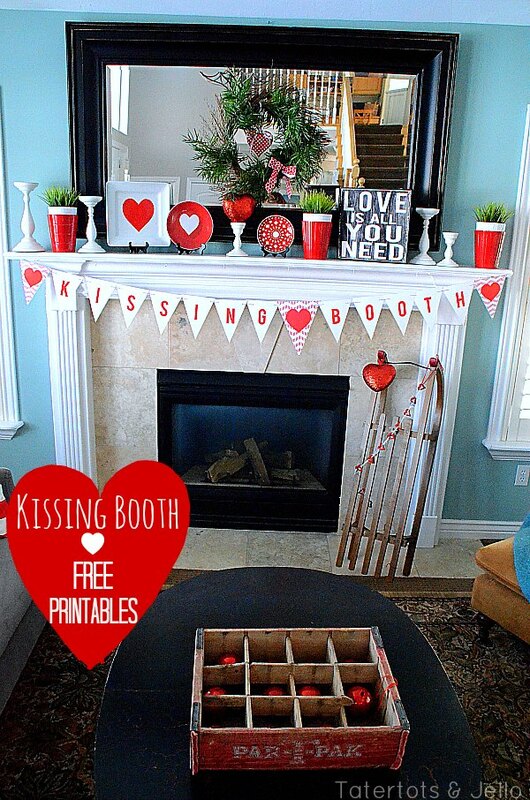 So I thought I might make a printable Valentine bunting. 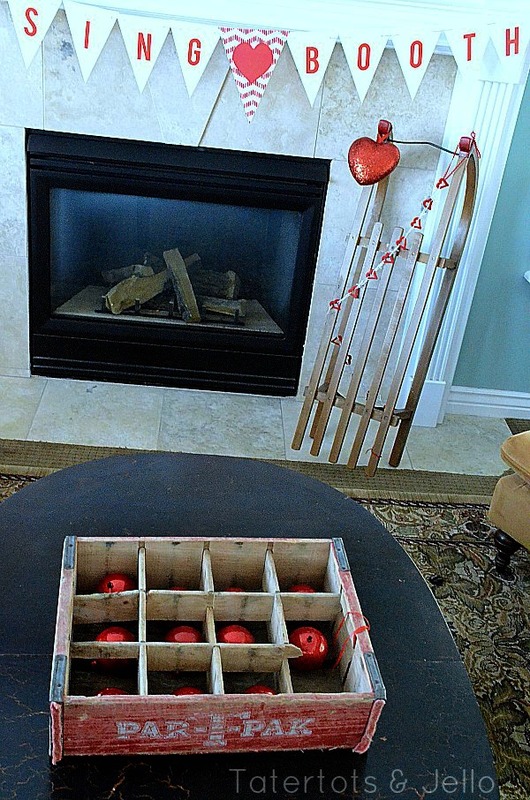 I love vintage themes, and I was able to go to a vintage fea market last weekend —Fleaology, where I found a pretty RED vintage crate. 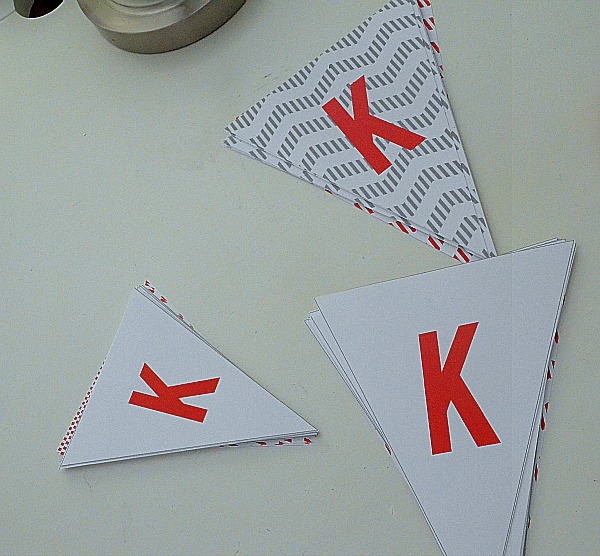 It gave me an idea to create a vintage-themed bunting. I printed it up and strung it with some red and white bakers’ twine. So easy!! I love the way it looks on my mantel. 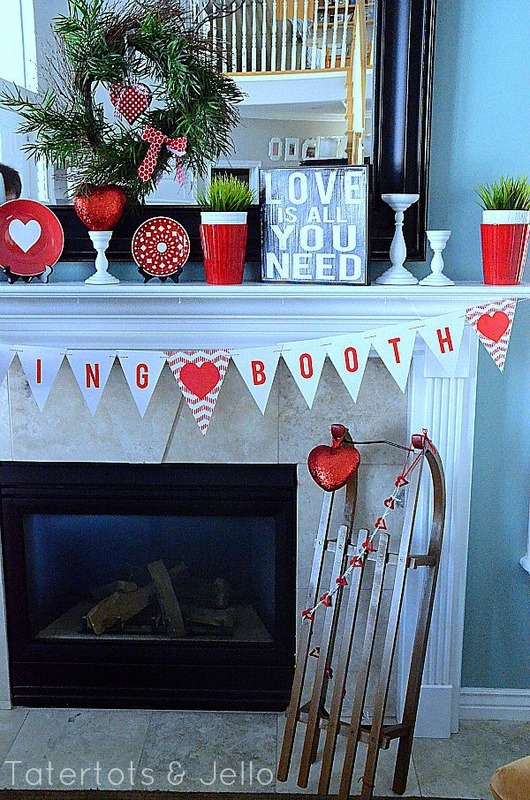 I wanted to go with a clean Valentine theme for the mantel. So I chose a green wreath that kind of reminds me of Spring. 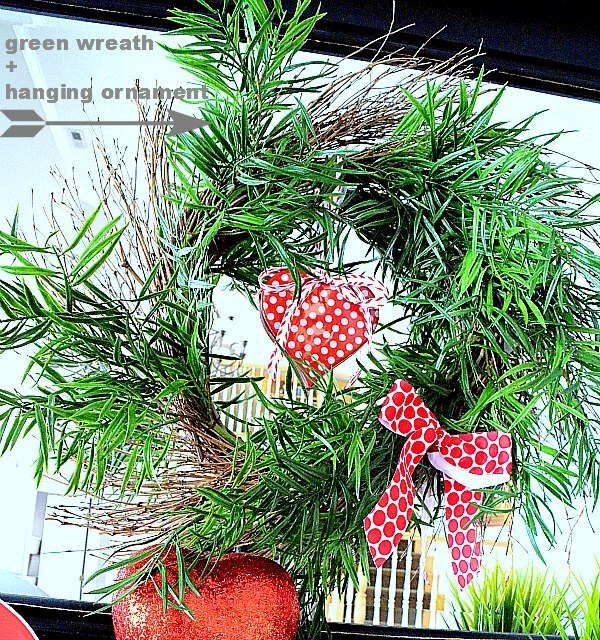 Then I hung a red and white heart ornament from the middle of the wreath and added a red and white polka dot ribbon on the side. Super easy and simple. I also added some red and white plates. 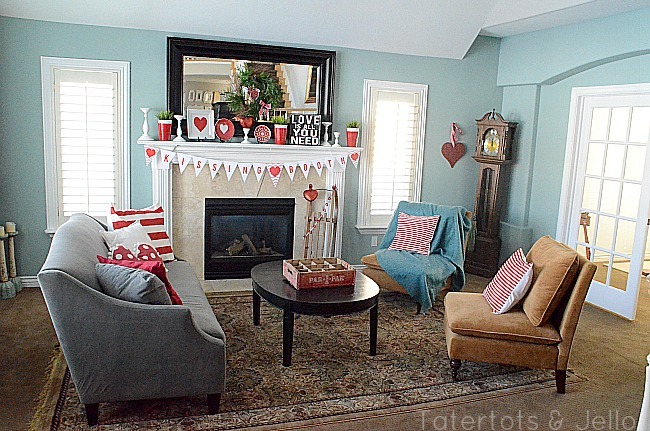 This is an easy way to decorate for Valentine’s Day. You can take a plate and add a simple vinyl heart to the center. You can cut them out with your Silhouette machine, or just hand-cut the vinyl out and stick it on a plate. I also added some Ikea wooden candlesticks. I use these all the time. The white color is so easy to use for all kinds of holidays and seasons. I also used some white and red vases, also from Ikea. 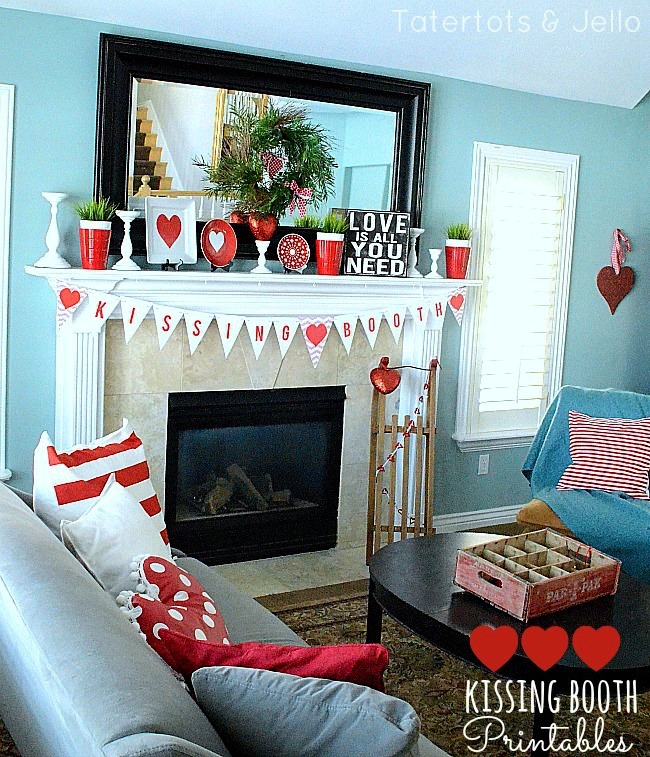 I love the red and white theme, along with hearts and greenery = an easy theme for Valentine’s Day!! My husband helped me figure out how to make the bunting. And yay — we made SIX different printables. Perfect for ANY type of decorating. You can print them out at home, or send them down to your local Kinko’s store for an easy way to decorate!! So here are the six (!) printables! They come in FOUR sizes – with or without the background, so make sure you get the size you want. Be sure to estimate your space. There are 15 flags to a string, so multiply that by the width of the flag, and figure you’ll need at least that in inches to make your bunting hang right. So, if you’re choosing the giant size, you’d need 8×15 inches, or 120 inches … 10 feet! You could also do them in two rows, so you could just print an extra heart flag so you’d have four total — enough to put on each end of each of two rows. Tiny size — about 2.5 inches wide and 4 inches high. This size has the letters only with white backgrounds. “Smaller” size — about 6 inches wide and 7.5 inches tall. Only the white-background version. Regular (giant) size — about 8 inches wide and 10 inches tall. Both versions. PS – I am linking up to Tidy Mom’s I’m Loving It Party!! 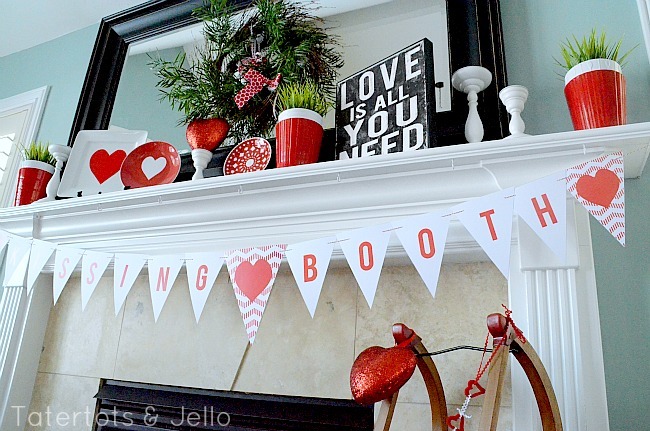 I Love You Valentine’s Banner Printable! Love Potion No.9 Valentine Idea and Free Printables! “You Have Captured My Heart” Gift Idea & Free Printables! Valentine’s Day Printable: Sunburst Red and Pink Valentines! So fun Jen! I wish I had a mantle to decorate! LOVE LOVE this Jen!!! So adorable! Thanks Angie – you are so nice! That really made my day. Have a happy weekend!! Darling Jen! I love it all! I love the red heart on the red plate, so cute! We have a mantel but our TV is above it (which I do love, but sometimes I wish I could go all out and decorate above it). But stringing a bunting banner across it, I so can do!! 🙂 Thanks for the printable! !